Wekukso Falls is where the Grass River, which snakes its away across northern Manitoba, drops 12 metres through a series of rapids. There is very short trail leading to one of two suspension bridges that cross the falls at two spots. These bridges not only give an excellent vantage from which to photograph the falls, they also get you close enough to really sense the power of the tumbling Grass River. In sight of the falls are walk-in tenting sites – no jokes, these may be some of the most beautiful campsites in all of Manitoba. The falls themselves are part of Wekusko Falls Provincial Park, which is about two hours northeast of The Pas and Flin Flon. There is a full service campground along with boat launches. The mouth of Wekusko Lake, where the falls finally finish their decent, is a popular place for fishing. There is a beach and even a special swimming spot for that furry, four-legged member of your family. Just across the highway from the park is Wekusko Falls Lodge, a collection of modern cabins ranging from one to three bedrooms. Located at the upper end of the falls, which are just small rapids here, the ambiance is easily enjoyed from the end of the dock or from the lovely fire pit area with swinging benches. Guests can also enjoy free marina services and there are meal packages available, as hearty home cooked meals are a great way to start and end your day. While guests have priority booking on the lodge’s fleet of boats, public rentals of both motor boats and canoes are available. A convenience store is open during the summer (the cabins are available for rent during the winter as the ice fishing here is amazing!) offering a selection of fishing supplies, snacks and souvenirs. While fishing is usually the main draw for visitors to the lodge, just a short boat ride up the Grass River into Tramping Lake leads to an incredible site, Indigenous pictographs, or rock paintings. You can arrange a trip to see these paintings on the vertical rock face with Wekukso Falls Lodge or paddle there yourself. Depicting animals, tools and other figures, there are conflicting reports on the age of these paintings. But it is likely that the ancient artists were seated in canoes as many of the pictographs are just above the water level. You can also drive a short 15 minutes north from Wekusko Falls to check out the quaint town of Snow Lake. Learn about the community’s mining past at the Snow Lake Mining Museum or relax in the Ladybug Garden, which is as cute as it sounds. Wekusko Falls Provincial Park is a nearly 7 hour drive from Winnipeg. 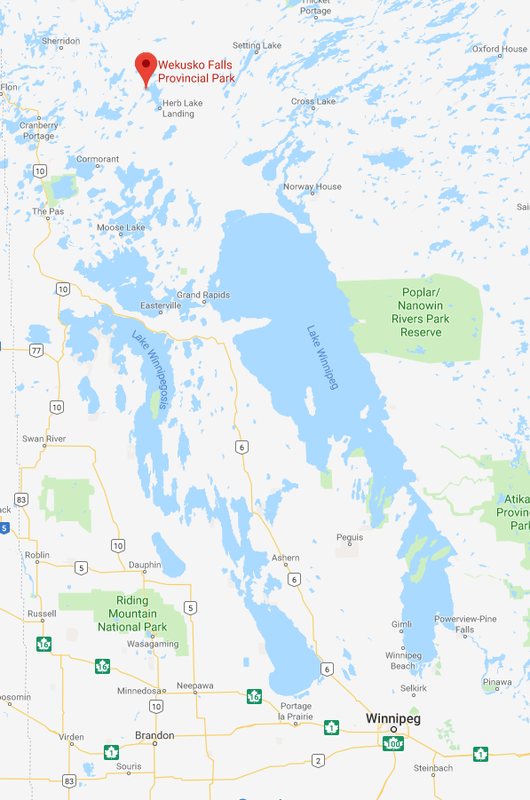 There are also flights available to The Pas or Flin Flon, shortening the drive to just over two hours.